White Zara Skort Shorts first appeared on Chictopia's streetstyle gallery in Spring 2013 seen on 日本 blogger NanaHoshino of nanastars.blogspot.com. She styled her white Zara skort shorts with a light pink cardigan, black floral top, and black diana heels. Since then, White Zara Skort Shorts have grown in popularity as bloggers from Seattle, London, and 日本 have discovered them. White Zara Skort Shorts are generally seen in casual, basic, and trendy style. Popular types of White Zara Shorts are jeans, high waisted, lace, denim shorts, and skort. There are currently 20 streetstyle photos of bloggers wearing White Zara Skort Shorts. 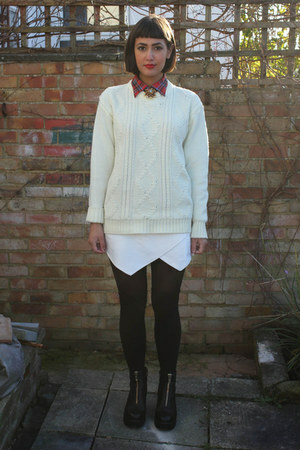 Most recently, blogger AgirlnamedNydia of agirl-namednydia.blogspot.com rocked her white Zara skort shorts with a white Zara eyelet top. "A wound to every memory arrogant enough to linger"